London, UK – 22 March 2018 – Canon Europe, leader in imaging solutions, is officially launching this year’s Young People Programme for 2018 at this year’s Global Festival of Action for Sustainable Development with the help of two of its student storytellers and the UN SDG Action Campaign. Participants from the programme have appeared alongside Stuart Poore, EMEA Director of Sustainability and Government Affairs, Canon Europe, and Photojournalist and Canon ambassador Ulla Lohmann, on UN Web TV to share plans for the year ahead with Mitchell Toomey, Global Director of the UN SDG Action Campaign (Sustainable Development Goals). Now in its fourth year, Canon’s Young People Programme seeks to contribute towards the achievement of the SDGs by giving young people a voice through harnessing the power of positive visual storytelling to drive change. 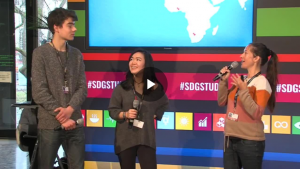 The programme uses the SDGs as a framework to give young people the opportunity to talk about the global issues that affect their futures and by providing the right tools and coaching, it aims to bring participants’ stories to life. Canon Europe has been delivering visual storytelling workshops for young people since 2015, and to date, 14 countries across Europe have run events, reaching more than 3,000 students. “The Young People Programme is a good example of how Canon Europe is seeking to make meaningful social investments across the EMEA region, demonstrating our commitment to our corporate philosophy of Kyosei: living and working together for the common good,” says Stuart Poore, EMEA Director of Sustainability and Government Affairs, Canon Europe. “The Canon´s commitment with the SDGs through the Young People Program is a perfect example there are many organisations, companies and people truly engaged in creating real solutions to bring the SDGs forward. We cannot do this alone, we need the young people and we need to hear their voices, and include them in the action needed to achieve the Goals. I feel inspired by the amazing visual stories created by the Young People and look forward to finding what we will create together in the next chapters of this program. ” said Mitchell Toomey, Director of the UN SDG Action Campaign. The UN SDG Action Campaign is a special initiative of the UN-Secretary General, administered by the UNDP to create awareness about the 2030 Agenda, empower and inspire people across the world to achieve the Sustainable Development Goals (SDGs) while generating political will, and help make the Goals attainable by 2030. Canon Ambassador, Ulla Lohmann held a ‘how to’ session, showing attendees all the ways they can use storytelling portraits to add strength to their SDG successes, get them heard, inspire others and drive continued support for their work. She’ll share how to build a story, make a personal connection with a subject and share the results with the wider world. Canon’s exceptional printing technology brings a powerful exhibition of photography to life that shines a light on the real human stories behind the SDGs. Photography from the Young People Programme will sit alongside that of the UN SDG Action Campaign.